The “cells” are in a basement of the Stanford University campus. The “guards” and “prisoners” are mostly hippie kids to whom participating in a psychology experiment probably sounded more interesting than a typical summer job. But overseen by a psychology professor who loses his objectivity, it spirals quickly out of control. 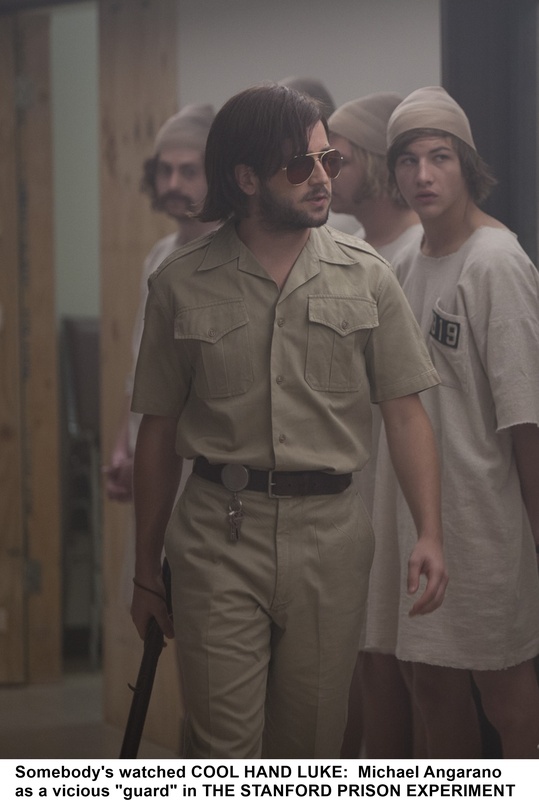 Welcome to The Stanford Prison Experiment, Kyle Patrick Alvarez’s drama recreating the notorious 1971 event. Billy Crudup is Dr. Philip Zimbardo, whose study is try to get at the root of abuse in prisons and the conflicts between prisoners and guards. The experiment was funded by the US Office of Naval Research and its timing couldn’t have been more apt: three weeks before the deadly Attica Prison riot. It begins with dehumanizing the prisoners. They are not to use their names, only their assigned numbers. Their uniforms are shapeless (and emasculating) shifts—a cross between a hospital gown and a dress. Their hair is partially hidden underneath stocking caps further blurring individual identity. The guards, too, lose their individuality, wearing identical khaki outfits that mimic actual uniforms and mirrored shades that make eye contact impossible. The situation veers toward hysteria from the start. The guards make a sport out of mistreating the prisoners in their care. One, Christopher Archer (Michael Angarano), is nicknamed “John Wayne” by the prisoners, but he’s clearly seen Cool Hand Luke a few too many times and models his behavior on that movie’s cruel overseer played by Strother Martin. He makes it his mission to make the inmates’ stay in Stanford’s basement a living hell. The convicts push back, Daniel Culp/8612 (Ezra Miller), Peter Mitchell/819 (Tye Sheridan) and other prisoners rebel in various ways and sometimes react with impotent fury. Each move by prisoner or guard escalates tensions. None of it is real, but as conditions deteriorate, it’s easy to see how the individuals involved might forget that they are playing roles.